New shipping container homes could be headed to a District government-owned lot in Rosedale, near the H Street corridor. The lot, located at the 1600 block of Kramer Street NE, is available for redevelopment. Neighborhood Development Co. was one of three firms who presented a proposal for affordable and market-rate housing at the local Advisory Neighborhood Commission’s Economic Development and Zoning Committee Wednesday night, District Source reported. 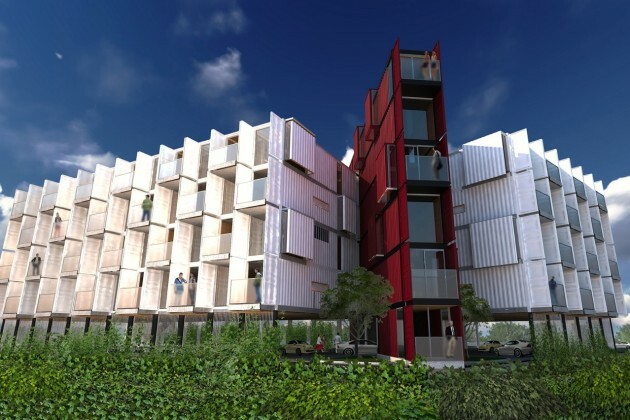 Under NDC’s plan, there would be 26 units spread across 13 flats, designed by Travis Price Architects — the same team behind the SeaUA shipping container building in Brookland. The residences would be two-bedroom, two-bathroom units; two of the apartments would be offered at 50 percent Area Median Income (AMI), eight at 80 percent AMI and the remaining 16 at market rate. The proposal did not include parking, which raised some concerns at the meeting, District Source reported. Using recycled shipping containers allows for a swift construction process. Giulioni said that the building the apartments would take about three months “because it’s pre-fabricated, a lot of it is done off-site, and then we do interior finishing,” Hill Now reported. The two other developers who presented this week were Manna, Inc. and Mi Casa, Inc. Manna’s plan entailed 10 houses with one parking space each at the rear, with a mix of two- and three-bedroom units. Four units would be affordable housing (two offered at 50 percent AMI, two at 80 percent AMI). Mi Casa proposed 12 three-bedroom houses, each with a parking space at the rear of the property. Ten of the units would be affordable housing (5 at 50 percent AMI, 5 at 80 percent AMI). These homes would use solar energy to meet the “zero net energy” standard. The DC Department of Housing and Community Development will review the three developers’ proposals. Redevelopment proposals for the property are due to the DHCD on February 19th.